A MAJORITY of the members of the supreme court have no right to change and ought never desire to change the constitution; had it been otherwise, we might not now be in union. The constitution contains within itself the enumeration of the methods by which it may be amended; and in the process the votes of the nine justices of the supreme court weigh at the polls no more than those of any nine private citizens. The constitution appoints them to decide the cases that come before them; in deciding those cases, they are led to express opinions about its meaning; and the declaration of the opinions on which the case is decided may influence the subsequent conduct of business in the court in similar cases; but, to use the golden words of Marshall spoken for the court of his day, "We must never forget that it is a constitution which we are expounding; that is to say, that the constitution is a law of laws, binding every department of the government and every citizen, the president and congress, the states and the union, the court and the people; and unchangeable by any act which either of the three branches of the government or all three together may be called upon to perform. Every opinion that is given upon it is subject to examination and reexamination, and perpetual comparison with the constitution itself. The court in 1860 could not dictate the law to the president of that year; and cannot now dictate the interpretation of the law to the president or to congress; nor exempt from correction a false interpretation of a law. It decides the case; and right or wrong, its decision must prevail; but the constitution has a life and power of its own. Were the court to assert a right to establish new readings of the constitution by its decisions of cases, it would be an attempt to usurp a power to amend the constitution. The law which imposes an oath of office on the court, imposes respect for the constitution and the laws, and knows nothing of decisions of the court that can be superior to the constitution. An interpretation of the constitution by the court, to be permanently valid, must not only be the opinion of the court at the moment, but must be in conformity to the constitution, and every time it is repeated must owe its validity to that conformity. The candle must be lighted every time at the primal light, which must be preserved in vestal purity. Men believe in Sir Isaac Newton's law of gravity, not because it was pronounced by Sir Isaac Newton, though he was the highest judge of his day on the laws of the planetary motions; but because Sir Isaac Newton in laying down the law pronounced that which is true. It is with legal science as with every branch of science; truth alone has the right to endure, and truth alone does endure. Bury it, and it will spring from beneath the earth. The court that tried Galileo gave the decision that the earth does not move; "but it does move" said Galileo, adhering to the truth, while submitting to the judgment in the case. In this doctrine there lies no antagonism to the present supreme court of the United States. I am but repeating what is known to be the understanding of the court, and as I believe of each one of its members. The opinion in the present case is a reversal of the first opinion given on the subject by its predecessors. Moreover, when one of them on the circuit pronounces what he finds to be an erroneous decision of a case, like a man of honor and an upright judge he corrects it when it comes before the whole court on appeal. Much more is the court bound to depart from a wrong interpretation of the constitution. The security of the people against changes of the constitution without their own consent must finally rest with the people themselves. The constitution is confided for its preservation to the inmost thought and affection of the people of the United States; they must be its ultimate guardians. But the remedy for the wrong decision of the court now under consideration should be nearer at hand than through a summons of the whole country to meet council and amend the constitution. In our beautiful system of union every contingency is provided for. When the court of last resort decides a case, the executive government accepts the decision on that case as final; but the constitution is the master of the court, which they are bound by their oath of office implicitly to obey; to support, not to alter, nor, so far as they are concerned, to suffer to be altered. They must ever be as learners at the feet of those who made it; reverently searching after its true meaning; and in their sphere setting themselves against every tendency to the claim of an exclusive, absolute, and final power of interpretation. In this case the court proceeded to its judgment on a case of which both sides were made up by one man, without even hearing or inviting a public argument. The present court itself should impartially reexamine what it has uttered, and cannot fail to perceive that it has somewhere fallen into error, since it has not failed to contradict itself. It is to be hoped that the court will not persist in an erroneous reversal of the just judgment of its predecessors, when better investigation establishes the rightfulness of that first opinion. In the immense amount of business by which the supreme tribunal is oppressed, mistakes may not always be avoided. An error becomes an immorality only when it is persisted in after it has been found out to be an error. The people should wait; the court from its allegiance to the constitution must correct its own misinterpretation. "Ubisilent leges incipit bellum." "War begins when the laws are silent." The lovers of the constitution have a right to look to the court to establish order by restoring the rule of the highest law. No thought should be admitted of correcting the error of the present members of the court by seeking a change in the constitution; the constitution is already as clear as it can be made. We are now the citizens of a commonwealth which for opulence, and the number of its people, exceeds any present or former republic, and almost any empire or kingdom of the civilized world of today, and it is just to consider our relations to the rest of the world. Obligations as old as the life of the country qualify the legislative power of congress. 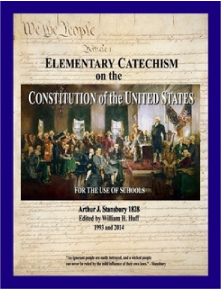 When the United States made their declaration of independence, they announced to the world "their purpose to assume among the powers of the earth" a "separate and equal station;" and by thus taking their seat among the family of nations, they recognised the existence of international law, and with it the obligation of contracts between citizens of other states and our own. Further, the people of the United States, in forming a constitution, were moved to do so, among other reasons, in order to "establish justice." This requires a fixedness of the standard of value which cannot be preserved with the use of paper money. It is in vain to attempt to enable debtors to discharge their debts by payment of currency of less real value than was intended in their contract; for as debts are discharged from day to day, it would require a daily increase of the amount of currency in order to give an impartial advantage to debtors, and this would soon render the currency worthless. What the great industrial class needs is a stable currency, so there may be as little fluctuation in industry as possible. To quicken business under an artificial expansion of currency is to pull out the linchpins from the wheels of the car of industry before starting it on the race at full speed. The sudden increase of prosperity is followed by still greater decline, and the weight of sorrow must fall on the laborers, who, with their families, will be made wretched by the loss of employment. The only class of men who can be benefitted by an uncertain and ever-varying currency is the men who, having too great conceit of their own abilities, and too daring confidence in their own favoring fortune, overvalue the chance of gain and undervalue the chance of loss, and so tempt themselves or are tempted by others to enter into engagements beyond their means to fulfill. They constitute an incalculably small part of our population, and by no means the part that possess the greatest merit, or deserve the greatest sympathy; and when they begin to surmise the delusiveness of their schemes, they are the most ready and the most unscrupulous in their attempts to dictate a policy to the country. Adam Smith, who made the last revision of his work during the year 1783 and the beginning of the year 1784, just in time for the instruction of the framers of our constitution, says: "It is not because they are poor that their payments are irregular or uncertain, but because they are too eager to become excessively rich." The country now, with sixty millions of inhabitants, moves with an infinitely increased momentum. The changes that take place when an error has been pursued cannot be recovered but through the efforts of many years, it may be of a generation. There is even danger that, instead of growing better, affairs may grow worse. Let us then see who in our republic are the capitalists, and who the debtors of the country. The greatest debtor of all is the United States itself. Shall it discharge the money borrowed to save the life of the nation by the use of its own paper money? The next greatest debtor may be the banks of circulation and deposit in the city of New York. The banks embody the wisdom that comes from experience, and they, with one voice, desire to pay their debts as measured by a uniform standard of value. Should it be replied that there are many debtors to the banks themselves, it may likewise be said that the banks, if they keep within the limits of their proper business, discount and facilitate exchanges rather than lend. Our merchants engaged in foreign commerce are debtors for such amounts as attend the annual importation of hundreds of millions. Shall they take advantage of their creditors abroad by paying them in a depreciated currency or one of ever varying value? The gain would be dishonest and transient; the impairment of credit would bring inconceivably large losses on all consumers, especially on the poor, for the advance to them of prices increases in proportion to the smallness of their purchases. Our courts would be dishonored and shunned by men of every other nation on earth. Enormously large debts have been incurred for the construction of canals and railroads. Shall these debtors be encouraged to escape from their obligations under the shelter of this new system of constitutional law? Time was when the holders of the plough in Illinois, in their capacity as a state, became largely indebted for many millions in Europe. They could not pay, for they had little with which to raise money except the harvest of their wheat fields, and these could not avail them, partly from the lack of cheap transportation, partly from foreign corn laws which excluded their wheat from a market in the land of their creditors. Should they have taken advantage of a temporary actual inability to pay to disclaim or compound their debt? They might have done it. But the farmers of Illinois wished others to estimate them by their own self-respect and their own regard for the moral law. With the acquisition of ability, they paid their debt manfully and have been rewarded by a prosperity and increase of wealth which neither unfavorable seasons nor fire have been able to arrest. Life is short. The whole family of man dies away and renews itself thrice at least in a century, and thrice at least in a century all the property in the country falls into the hands of probate courts, executors, guardians, and trustees. Shall this enormous class of debtors have an opportunity by a choice of currencies to defraud the widow, the infant, or the orphan of their inheritances? Our best American industry is frugal; and of the modest returns which it gets for its labor sets aside a part as the solid security for comfort and independence in sickness or old age. These sums, though in no one case more than five hundred dollars, in the aggregate reach millions upon millions; and shall the managers of the savings banks of the country who are the debtors to the industrious poor for these slowly accumulated funds be authorized by congress to pay them back in a debased currency? The infinitely most numerous class of capitalists in the United States are those who support life by their constant labor; the greatest number of them are the poor who earn slowly and earn but little. Shall they be paid in paper money or debased coin, and so be defrauded of the hope to set apart a pittance for the day of sickness or old age? Nothing is safe for all classes of laborers who, as capitalists receive the return for their labor in money, but money of a standard that does not swerve. Terrible were the scenes of anguish, when about fifty years ago emigrants with their wives and children about them, on their way to purchase public lands, discovered that they had exchanged the earnings of their constant and frugal industry for bills that proved to be of bankrupt state banks. The speculator alone delights in a fluctuation in the value of money, for it opens to him new chances of gain. A wavering currency or coin is most deadly to the interests of the poor; for they have the least power to protect themselves against it. They are the first to suffer from a decline in the value of the currency and the last to recover their rights when improvement begins. The wealth of America is all within itself. Our extent, the value of the productions of our soil and the need the world has for them, the ingenuity of our people and the extent of our domain invite us to take the highest place among nations in point of credit. Shall we allow the opportunity to pass over us? Shall we by errors of financial legislation despoil the farmers of the country of the fair return for their industry? Shall we consent to sink in credit behind the states which are in highest esteem? If we do, the exchange not with England only but with all the solid commercial world will turn against us. We have had every opportunity of making our money equal to that of the best in the world. Shall we throw it away? The moment of choice is less favorable than it was, but the choice is still before us. If we refuse to avail ourselves of our opportunity, it can hardly be recovered except after a series of calamities. How much better it would be to hold prosperity fast, while she asks to make with us her home! And let us not forget that we are forming opinions and laws that in a less period of time than has elapsed since our declaration of independence are to govern five hundred millions of people. The United States have established a service to watch the fluctuations of the weather and signal when the infant whirlwind starts on its race, and the swifter electric spark, running before it on thousands of wires, announces to millions of men "whence the wind cometh and whither it goeth," and when it may arrive. And with regard to the higher interests of the country, shall not our statesmen keep watch on the signs of the times and warn the people of the storms that are threatening their industry? I plead for the honor and the welfare of our country, while I defend the men who by their industry fill our land with wealth. A fluctuating currency is bad for all but the speculative, who are but a handful among millions. It troubles the rich; but it strikes a destructive blow at the heart and hope and welfare of the infinitely more numerous class of capitalists in the United States, the owners of their own powers of body and mind, of which the value is multiplied by their industry and their morality. I speak for the poor who can as little be benefitted by an uncertainty in the value of the authorized legal tender as by the use of varying scales and weights in the market. Nor let my words be unheeded, because after living in many lands and observing the effect of differing customs and laws I have retired from society and active life. Old age, I well know, has its evils. The senses begin to fail. Memory sometimes seeks in vain to read its old tablets or engrave on new ones. Our thoughts, it has been said, like our children, sometimes die before us. But the man of many years can look before and after; and seated under the tree of life, enjoying "sweet rest with full content," he finds that the leaves which have fallen from its branches have but opened a clearer vision of the eternal stars. The experience of many years may add to early intuitions the large inductions of experience; and so produce a clearer conviction of a superior ordering of human affairs, and the overruling influence of general laws. I have written because I am persuaded that a firm and right establishment of the true relations of money to labor cannot be secure in a republic except by cultivating the mind of its people, and diffusing a knowledge of the truth through all its members. The honest illusions of many men must be dispelled; and their minds, ransomed from error, will discern the truth. Paper money is a corruption of the blood. Or paper money is the dry rot, which silently and unseen consumes the beams and joists which support the house and its floors. I am pleading the cause of industry, the cause of labor, the cause of the poor; and yet as I do not believe that the interests of the various classes of society necessarily clash with each other, I may hope that I am pleading for the welfare of society, for the rights and duties of all who in the many diversities of honorable occupation contribute to the completeness of a nation. What I have written is the fruit of many hours, employed in examining the laws of our period of colonial life, as well as in the study of our own constitution and of the corresponding history and affairs of many lands. I may utter these last words of admonition as assurances of that love of country, of liberty, and of truth that has been the rule of my life, and still glows in a heart which must so soon cease to beat.